Tough choice: $75,000 Camaro or $15,000 gingerbread playhouse? The Christmas Book, Neiman Marcus' annual gift guide for the uber-rich committed to conspicuous consumption, has included limited-edition Aston Martins, Bentleys and Rolls-Royces. This year the nod goes to ... volume-brand Chevrolet. 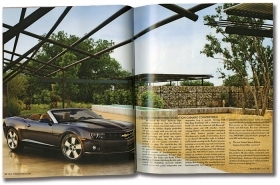 Only 100 copies of the $75,000 2011 Neiman Marcus Edition Camaro Convertible will be built. The muscle car comes with a 6.2-liter V-8 and either a 426-hp six-speed manual or 400-hp six-speed automatic transmission. It also has an exclusive tri-coat exterior paint in what the retailer calls "Deep Bordeaux with ghosted stripes." While it's always nice to be honored, the Neiman Marcus Christmas catalog isn't necessarily the image venue you're looking for in an economic climate when many people are struggling to make ends meet. The Camaro, for example, is just two catalog pages away from the $15,000, 6 1/2-foot-high, 900-pound edible gingerbread playhouse that some overindulged tot will find in the playroom on Christmas morning.